What is interesting about the loss of the tanker Lubrafol off east Florida is that following the attack and abandonment the ship appears to have gone missing and drifted about for three days before grounding further north – right off the coast of an actively patrolled coast line. 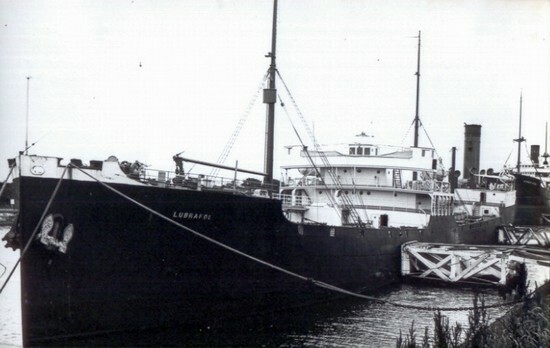 The motor tanker Lubrafol was built in 1924 by the Sir W.G. Armstrong, Whitworth & Company Limited, Newcastle-upon-Tyne, England. Flagged to Panama, she was owned by the Belgian Gulf Oil Company SA (Societee Anonomee) of Antwerp. Her early history is well encapsulated by the authors of the website Uboat.net: “Laid down as British Scottish Highlands for Tankers Ltd, London, completed in November 1924 as Belgian Lubrafol for SA d’Armement, d’Industrie & de Commerce, Antwerp. 1933 sold to Belgian Gulf Oil Co SA, Antwerp. In November 1940 laid up at Port Arthur, Texas. On 24 Apr, 1942, the Lubrafol was time-chartered to the US War Shipping Administration (WSA) at Aruba.” (Uboat.net). On the 9th of May 1942 she was en route from Aruba to Bayonne, New Jersey via the inshore route through the Yucatan Channel and Straits of Florida when she steamed into the eager crosshairs of Teddy Suhren off Hillsboro Inlet, Florida, near Boynton Beach and roughly three miles east of Pompano Beach. She was carrying 67,000 barrels of #2 heating oil. Her master was Captain Eugene Van Schoenberg who ran a crew of 43 crew including six armed guards, all of them Americans. The crew themselves were a polyglot bunch, hailing from Belgium (the Captain), Norway) John Michelson, the First Officer), USA, Canada, Puerto Rico, Sweden, Holland, and Ireland. For several days previously Captain Scheonberg had been frustrated by the garbled radio transmissions from Jamaica which he had been unable to decode. He had complained about the Jamaican sending station before and was concerned that he was being sent routing instructions that he could not understand. At 0315 in the morning of the 9th of May Lubrafol was steaming north at 11 knots but making 12.5 knots over the ground 3.5 miles from Boynton Beach and 10 miles north of Hillsboro, Florida. At that minute a torpedo from U-564 smashed into the #5 oil tank on the starboard side amidships near the bridge and set the cargo in both that tank and #1 tank on fire. Simultaneously the foremast came toppling down onto the bridge, killing two members of the bridge team and eliminating the radio aerials and causing great confusion at the brain center of the ship. At the time of the attack no fewer than five men were on watch: three on the bridge, the Second Officer and Gunner. The master was able to put the wheel hard to port in order to keep the flames from blowing downwind from the explosion and not across the ship. The number three life-boats’ falls were burned through, causing the boat to break away and fall into the sea, useless. However the #1 port side forward and #4 starboard side aft lifeboats were launched, the latter in command of the first officer. Though forty two of the forty four men on the ship managed to make it away from the burning tanker “immediately” and alive, the raging oil fire caught up with the First Officer’s boat and set it, too on fire. According to survivor statements, “several men became panic stricken, jumped over-board and were lost.” Fortunately two US Coast Guard Cutters – one of them bearing the number “214”, were in the vicinity and came to the survivors’ immediate aid. They towed the lifeboats away from the burning oil. For this “it was the Master’s opinion that without this immediate assistance by the Coast Guard the lifeboats could not have been pulled clear of the burning oil.” (Survivors Statements, NARA2). Two of the four life-rafts floated away from the ship, one of which was used temporarily as respite for the crew, who were waterborne in their own boats and rafts for an hour. Altogether seven bodies were recovered from those lost in the #4 life boat. Six persons were missing and 31 rescued and landed at Boynton Inlet at daylight the same day. According to reports, given the less flammable cargo, “the Master was amazed and at a loss to explain the immediate burning of the cargo of #2 fuel oil.” (Id.) While her complement of men were largely accounted for, the two dead who remained on the ship and their floating home were just beginning their saga. In the dry language of a report signed by A. J. Powers, and G. V. Salter in the US Navy, “the vessel, while burning, drifted NE at about 4 knots. At 09/0900 EST it was reported 9 miles north of an 11 miles out from Boynton Inlet. Lubrafol’s final resting place is given as 150 miles north of where she was attacked: 41N/80.01W. According to Barnette, “the stern deck gun can be found resting on the send, its barrel still pointing aft.” The wreck lies in 180 feet of water between Port Canaveral and Ponce Inlet. It was reportedly broken up in 1954, however remains such as the crow’s nest and boilers remain on site for divers and numerous fish to explore (Barnette Vol. 1, pp.143-44).